Let's do this together! We're here to help you with the tools, resources and motivation needed for seller success. 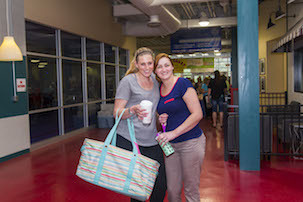 Bring your items to the Sportsplex at Warminster, check in, grab a rolling rack, and a copy of our Drop-off Map. You're set to put your items out on the floor! Checks are sent electronically within 10 days of the close of the sale. 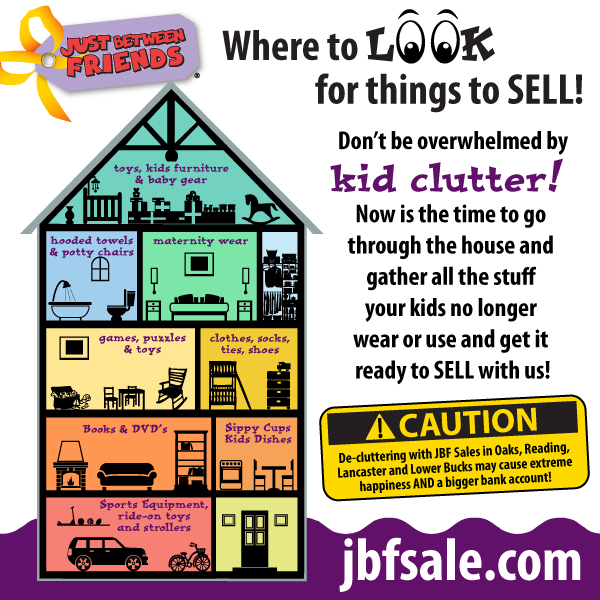 JBF Lower Bucks Consignors earn an average of over $350 at each sale and you can TOO! Use your smartphone or laptop to tag. It's so easy! Print Consignor "GETTING STARTED" GUIDE here! Helping at the sale is the #1 way to increase your earnings + you shop early not once but 2x! The online schedule will open on February 1st. The #JBFLowerBucks Team is made up of moms (and dads) just like you and we want YOU to join us! Team Members who complete a total of 4 hours earn 70% on their sold items + get a cool shirt! Valet Consignors who work at total of 4 hours earn 50% on their sold items. Please arrive by 8pm (all merchandise must be placed on sale floor no later than 9pm). Please arrive by 6pm. All merchandise must be placed on the sales floor no later than 7pm. (Power Consignors must drop off by 4pm, no appointment needed). 1. Prep, price and organize your stuff at home (see details below). 2. Drop off your items at the Sportsplex at Warminster ready to be sold. CLICK HERE for a list of items that go in our BIG TICKET AREA and need to get a YELLOW TICKET from one of our Team Members. 3. Bring your signed Consignor Waiver, Car Seat Waiver (if applicable) and one item with a barcode into the building. Check out the process HERE. 4. Watch your sales grow with real-time updates. It is seriously better than winning the lottery! Find more stuff to sell? Everything except clothing and shoes can be dropped off on Friday evening. If you are a Power Consignor (dropping off more than 300 items), and you wish to pick up your unsold items, you are required to help for 2 hours during breakdown. Signup for this shift on the Volunteer Schedule which opens on February 1st. Pick Up is totally painless. Take a TOUR from our Lancaster sale - the process is the same in Warminster! Consignors and Team Members Shop 1st! PLEASE NOTE: You are welcome to enter any time AFTER your designated time. Due to time and space constraints, we are unable to allow children under the age of 12 before Family Shop time at 7:00pm. The only exception is for nursing infants who can be worn on mom or dad. No car seat carriers or strollers before 7:00pm, please. per family. Purchase Tickets HERE! For the spring sale, think warmer weather. Check out the seasonal guidelines HERE. We DO NOT have a $3 rule at the JBF Lower Bucks sale. We encourage you to price your items competitively and use this guide as a resource. You are considered a Perfect Consignor If you have three or less stained, damaged, unacceptable or recalled items pulled from the floor at any time after you drop off. Perfect Consignors will be given a "gold star" (aka ROCK STAR STATUS) which can be used to get in 30 minutes earlier than your assigned Thursday presale time OR 15 minutes early for Saturday's 50% Presale. AND....Perfect Consignors are invited to drop off early on Tuesday, April 9th from 5pm-6pm!!! SWEET! New to JBF? Want to learn how you can clean up and ca$h in? We're here to help! We also invite you to join our private Facebook Page for sellers only. Ask any (and all) questions in the comfort of fellow mommas just like you! We won't leave you hanging! Swing by The Sportsplex at Warminster for one of our upcoming supply sales to pick up hangers, a tagging gun and/or card stock! Check out our Supply Sales Schedule HERE. You can also order online using the links below. We also host supply pick ups during the weeks leading up to the sale. Check out the schedule HERE. 2. Review and complete the on-line Valet Waiver. Upon completion of this form, you will be contacted by the Valet Coordinator to schedule a drop off appointment. 4. Admire your clean house and watch your sales grow! Pick up of unsold items is the responsibility of each consignor. Hi, I'm Tracy and I organize the Lower Bucks County sale! While this is a relatively new location for us, over the past ten years, we have helped thousands of Philadephia area moms and dads just like you, clean up and cash in with JBF. In additon to Lower Bucks, we (because this is a total TEAM effort) organize events in Oaks, Reading, and Lancaster...whew, that's a lot of stuff to coordinate and you know what? We love it! As a mom, I get it! Raising kids on a budget is tough...not to mention they grow out of things so darn fast. That's why we created Just Between Friends. Our award winning events allows local families to sell the items their kids no longer use, and get WAY MORE for LESS! See you at the sale!